There, I said it. Now, let's get on with getting over ourselves, shall we? Because frankly, if there is a "War on Christmas", its genius is not that it undermines the foundations of our faith, because it does no such thing. No, its Satanic genius is that it gets the church engrossed in a futile sideshow, when we ought to be laser-focused on the main event. Let's admit it: when we agonize over the erosion of our favorite Christian holiday, our complaint is not really about the world's rejection of Christ, but rather about the loss of our favored place in our surrounding culture. Yes, we are no longer the cool kids at the party. And this surprises us ... why? Put another way, if we truly understood what it meant to live as foreigners and exiles in the world, we would expect the world to try to marginalize us, and recognize that Christmas itself isn't really the point. Moreover, fighting this "war" over it takes our eye off the ball: the incredible, historical, world-changing, life-changing Incarnation of God's own holy Son; the mind-blowing truth that Christ was made flesh to redeem us from the fires of hell; the Gospel of Christ. The ministry of which is--by the way--our mission on earth. What's not our mission on earth? The defense of a favorite holiday--even one pregnant in Christian meaning (er, sometimes). I have become increasingly convinced that the War of Christmas is clever feint by the Enemy, one at which misguided Christians charge headlong and foolishly, wasting much precious time and energy. It is our very own Hamburger Hill--a meaningless objective upon which we spend our blood and treasure. We do this because we have lost sight of the most meaningful, God-ordained objective imaginable--the ministry of the Gospel--that Gospel which is rooted in the reality of Emmanuel, God with us. That is to say ... not Christmas, but Christ! Put simply, God did not call the church to defend the ancient historical circumstances that conspired to convert a polytheistic Roman festival into the church's favorite commemoration--the organized celebration of which is, at best, biblically ambiguous. No, beloved, let us not get distracted with the Enemy's sideshow about Christmas. 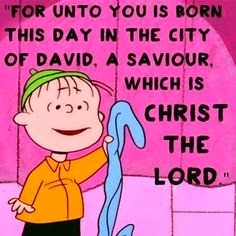 Rather, let us be rooted in the reality of the Incarnation of Christ! Let us be witnesses to the Truth! For if, as J.I. Packer wrote, "the Incarnation, this mysterious miracle at the heart of historic Christianity, is central in the New Testament witness", then Christmas represents not a battlefield, but an amazing opportunity to be witnesses ... to advance on the true battle for men's hearts. If we do not understand the weight of the miracle of the incarnation of Christ, it is because we do not understand the weight of the holiness of God. The incarnation is shocking. It is outrageous to think that an infinite and holy God would voluntarily become finite to live with unholy sinners. What if every Christian's conversation over Christmas was to center not on the loss of a holiday, but rather on the "shocking" and "outrageous" implications of the Incarnation of Christ? Why, then it would be the Gospel mission to which we were called! Then it would be Christmas every day.